Lot:6020 Elkton, Maryland. $10 1902 Plain Back. Fr. 624. The NB. Charter #1236. PMG Choice Very Fine 35 EPQ. Elkton, Maryland. $10 1902 Plain Back. Fr. 624. The NB. Charter #1236. 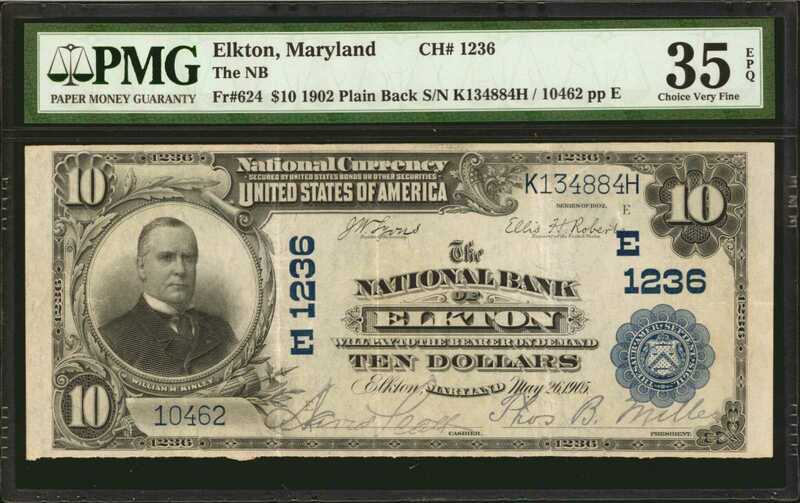 PMG Choice Very Fine 35 EPQ.A total of seven large are known on this Cecil County bank. This peach is the finest for any type and displays completely original paper surfaces, sharp signatures, and bold inks.